Perusing through the books at Readings Kids in Carlton is one of the many ways I love to spend my Saturdays. On this occasion I was so strong and only bought 3 books. Yes only 3… I’m pretty proud! Its always a Book Buying Affair when I hit a book store. Yep! I thought I would do a quick post about the books I bought because I think they are pretty darn spesh! I hope you do too. I love this book because of it’s beautifully simple message. Feeling the good feels? Pass that stuff on!! Spread the goodness all over town! The illustrations are simple yet striking! The use of colour is a real treat for the eyes. Your little reader will love it! The text is short and sharp so it’s an easy bedtime read! In a world where we have a surplus of critics and all round negativity, this book is definitely one for the collection! It’s a perfect story to demonstrate how sharing your spirit can be the most beautiful thing! 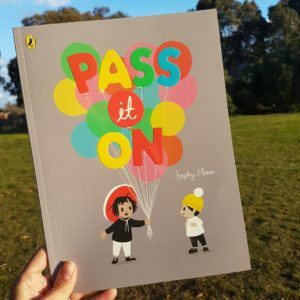 Can you encourage your little reader to pass on the good stuff? It could be a hug, a smile, a laugh or a hand! Get them to “assist the author” by illustrating another page for this book! How does your little reader interpret this concept? It would be interesting to see what they come up with! Have you ever felt too small to be noticed, respected, appreciated or valued? Lion gets so much attention and respect from the other animals! What can Mouse do so others respond to him in the same way?? Lion is brave and he roars SO loud! Maybe Mouse can learn to roar like that too?! Mouse should probably just go and ask Lion for tips?! I wonder how that will go for poor timid mouse?! Ha! Haha! Turns out big brave Lion is terrified of mice!! Mouse was so surprised that he had to console and support the Lion! Even though he was feeling shy, Mouse still went for it!! How brave!! An unlikely friendship that is incredibly sweet! Mouse has the heart if a lion even though he can’t roar like one! Both animals have so much to offer, just as us humans do! Encourage your little readers to celebrate themselves! Get them to write a list, make a poster, paint a picture, write a report or make a collage demonstrating what makes them special!! Get snuggly with your lil babes and enjoy this precious book! Celebrate eachother!! The front cover and end papers alone are enough to love this beautiful story! 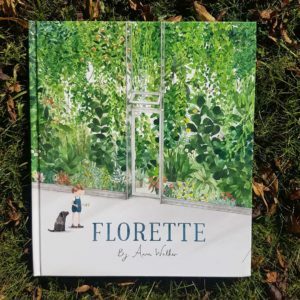 Read on to learn about Anna Walker’s magical new story about Mae and her precious garden! Mae’s family has moved to a new house. But she misses her garden terribly. There’s something about the hum of the city that just isn’t the same. Picnics aren’t the same either… even with her imagination firing on all cylinders. Mae longs to run through the thick wavy grass and dance with butterflies… but there are none. Mae stumbles across a forest in the city! Wow! Noticing a little stalk creeping through the bottom, Mae picks it and takes it home to plant. This is just the beginning of a beautiful new garden for Mae! This story is so special! What a wonderful tale of natural beauty, resilience and adaptation when faced with change. Mae’s imagination is so magical… just like her new garden! Pretty please get outside with your little readers and start a garden project! It can be big or little. Flowers or veggies. Even herbs! Whatever it may be, just let your babe’s hands get dirty and soak up some vitamin D. Watching something grow will help develop your child’s patience and nurturing. Watch your their eyes light up with wonder. Can’t get any more special than that! 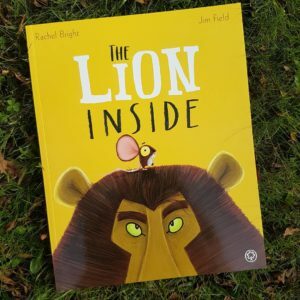 What’s on in August: A busy time for Kidlit!